It may be that, in Illinois, the state's reputation encourages a certain bravado. Blagojevich used the f-word to accentuate his adamantine insistence on getting a return from doing his constitutional duty. Journalists report news, and news amounts to a politician getting caught. A politician raising money in the ways politicians usually raise money is definitely not news, even if politics as usual has all the ethical uprightness of the Tower of Pisa. The truth is, it's hard to raise money in politics . . . if you are out of power. I know. I have been involved in fundraising for ballot measures or lobbying efforts around the country. It's not easy. All I can offer is a chance to change public policy. Sitting politicians, on the other hand, have huge advantages. Their duties include passing legislation and handing out lucrative government contracts that pack quite a wallop to the wallet. Incumbent politicians are positioned perfectly to say, "You have to pay to play." Government has powers for which some folks will pay a lot. A politician could make a lot of money for providing such private services attached to public goods. It's understandable. Renting a politician's services can go a long way to increasing one's own wealth. And, moreover, the politician's wealth. Most ways of paying are legal, though often ethically questionable. Some ways -- more blatant and obvious -- can be illegal while remaining hard to catch. Politicians know which words to use in avoiding a literal quid pro quo statement. Blagojevich suffers, now, from his bluntness, his gruff, vulgar corruption. But every politician is tempted with similar activity. Blagojevich serves as the tip of a much larger iceberg. Most just play it more subtly. So, Americans outside Illinois have no reason to gloat. The fact that their governors haven't been arrested does not mean their governors are not also dirty. Just, perhaps, more clever. Of course, some politicians are honest. Most people don't get into politics for the money. They get into it to "do good." Inevitably, politics is run on money, and money often becomes the only gauge some people can find for "goodness." And, my goodness, does this standard have awful repercussions. The longer a person stays in strategic loci of power -- that is, in office, or in bureaucracy -- the more that person will see funneling money through government as the solution to every problem. If all you have is a hammer, everything soon looks like a nail. Some folks are more resistant to this education in nail-pounding than others. This is a matter of personal psychology, I suppose, as well as personal morality. It helps if you make a public stand to resist the process. Self-term-limiters like Dr. Tom Coburn come to mind (as does the fact that public support for congressional term limits is at an all-time high). It also may help to know something of economics, for instance -- that is, the economics that recognizes limits to knowledge. To understand the complexity of that fabled beast, "the economy," and then to realize that no prediction can be certain helps inoculate oneself from schemes to control it all with varying amounts of power fueled by increasing amounts of money. 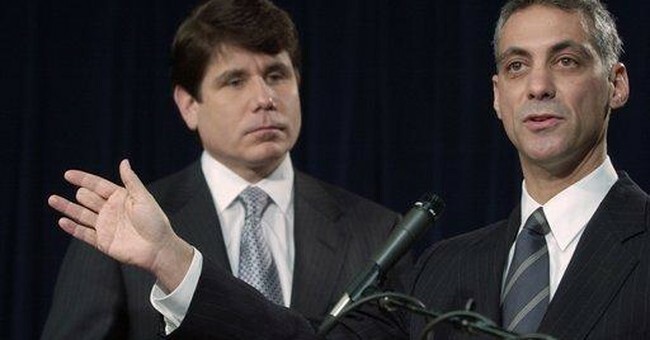 Governor Blagojevich surely deserves the hammering he's received in recent days. But it is important to hammer home a much broader point. Power corrupts. Politicians (being human, only more so) are susceptible to this corruption. Good government requires that citizens have practical ways to nail down the power of politicians. I bet there are politicians who worry that Bagojevich's latest bit of corruption might cause citizens to look more closely at all the rest.